Do you have Office 2016 installed on your Mac? By any chance does the spellcheck feature work in Word but not Excel? Here’s a possible fix. A client recently reported having this problem. Spellcheck worked properly for her in Word 2016. When she opened Excel 2016, she’d click on the Review tab and then click the Spelling button and nothing would happen. After trying a few common troubleshooting techniques I did some online research and found this Microsoft User Forum post which gave me the solution. The steps are detailed in the post, but I’ll re-post them here. Click on the Spelling & Grammar button. Look at the Language selected. Is it set to “none”. If so, that’s the problem. Click on the list of languages and select English (US), or whichever language you prefer. Use the image below as a guide. Curiously, this appears to be an inconsistent bug or problem in Excel 2016. 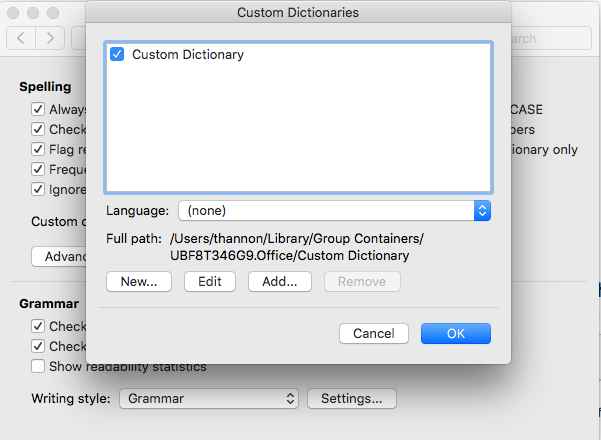 I opened Word 2016 on my Mac and the language for my Custom Dictionary was also set to “none”, just like on my client’s Mac. However, when I opened Excel the spellcheck feature worked properly for me. I do not know why spellcheck works on some Macs and not on others but I hope this tip helps you if you encounter this problem. Read more about 2016, check, Excel, mac, not, spell, spellcheck, work.